If you are looking for a great new apartment in a quiet but established neighborhood in Nashville, look no further than The Melrose Apartments. The A5 apartment is a 722 square foot gem tucked away in the Melrose district of the city. Known for its proximity to Vanderbilt University, The Melrose is a perfect place for students, staff and faculty to call home. If you are a Commodores fan from a distance, the Melrose still has plenty to offer. 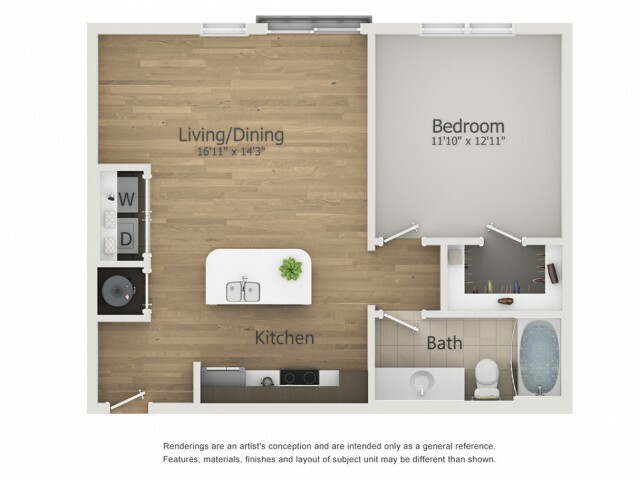 Starting with an open floor plan that provides ample storage and space for your belongings. Deep walk-in closets and in-apartment washer/dryer facilities adds to the roominess. The kitchen boasts a beautiful center island, granite counter tops, and solid wood cabinetry. The Melrose has thought of every modern convenience for our residents. Starting with a 24-hour fitness center, City Fit classes 3 times a week and bike racks. If you'd rather relax, do it on the sundeck by the saltwater, resort style pool, and well-lit courtyards. If you find yourself more of an entertainer, we have a live music performance space, clubhouse with demonstration kitchen and outdoor grilling area. If you need something for a family movie night, we have you covered with our resident’s movie lounge. The Melrose is a great living community especially if you love pets. Each unit is allowed 2 furry companions. We have a Bark Park on grounds for those dogs who call The Melrose home too. There is no need to venture far for a night out with several dining establishments on-site like, The Sutler Moon, Sinema and Fenwick’s 300. The surrounding area is littered with fine and casual dining not to mention shopping and markets. We have a coffee and tea bar for residents and a 24-hour business center for those late nights. There is no need to go far to find something to do day or night. The Melrose Apartments is the perfect urban oasis. Give us a call today at (615) 696-7448 to schedule a walk through.